Move over Kenny G here comes Lindsey B. This is my kind of easy listening. Lindsey Boullt is a guitar player from San Francisco who has an impressive roster in attendance on this debut; Stu Hamm, Jerry Goodman (Mahavishu Orchestra), Jon Herra (Bass Player Magazine) and Mingo Lewis (Miles Davis) to name a few. “Composition” consists of ten compositions each with its unique sound. Each sound as if they were written with the history and styles of the musicians involved in mind. Lindsey has his own virtuoso style and remains diverse throughout. He is also an accomplished composer who likes to use odd meters which gets me to…. He sure likes to keep it interesting. There is a diverse assortment of rhythms and feels on this album. I like the tasteful use of straight and mixed odd meters. I have to say, my favorite track is “Aurora’s Aura”, not because of the cute name, or because of its mixed meters but it has succeeded in sounding like a resurgence of Mahavishnu Orchestra with a new guitar player. I also like “Page Revisited” and the use of the 12 string. Here comes Page that has practiced 12 hours a day and now knows 5/4. Also, the sitar playing is amazing and feels right at home on “Taste the Hate” and “Cleopatra’s Third Eye”. All of the musicians on this album are quite seasoned, proficient and have their own distinct style. This album has succeeded in capturing the spirit of its musicians through composing and performance. It sounds as if, as Lindsey chooses his musicians, he hones in on their style/history and builds the composition around that. I wonder how much improv was going on it all sounded inspired yet pre-composed, a hard balance to achieve. Lindsey Boullt is quite the shredder with his own style and sometimes reminds me of Satriani and sometimes Jason Becker. He plays for the music with out sounding like he’s taking a typing test or is a MIDI program. 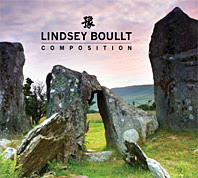 If you dig this genre, or are in the mood for some different rhythms, then this CD comes highly recommended LindseyBoullt.com. Add it to your cool easy listening collection.